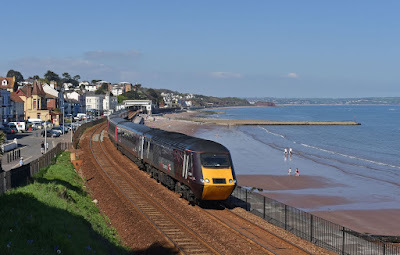 To commemorate the role played by the HST GWR have re-liveried two examples into past liveries, 43002 seen here skirting the sea wall at Teignmouth being named 'Sir Kenneth Grange' after the train's designer wears the original 'Flying Banana' Blue/Grey livery while 43185 has been adorned with the 'InterCity Swallow' scheme. 43002 is seen here leading the 07:27 London Paddington - Plymouth on a fine 5th May 2018. 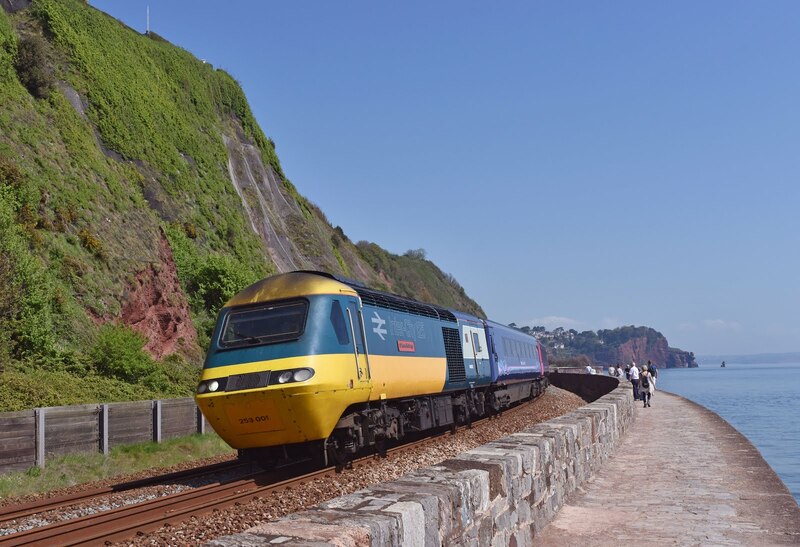 The InterCity 125 entered squadron service in 1976, and while it upset many rail fans at the time by displacing older loco classes the trains have become a classic in their own right. For over 40 years these trains have connected the major cities of the UK in comfort and style. 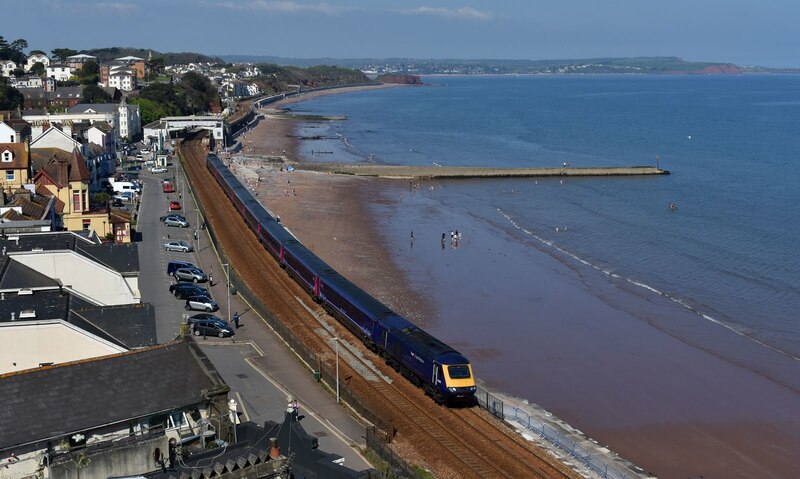 Widely acclaimed with rescuing BR's long distance services the HST (High Speed Train) has been at the front line of InterCity passenger travel ever since, regularly attaining it's top design speed of 125mph. 43180 leads its HST towards Teignmouth with a service to the west country. 43144 is on the rear of the train which has just emerged from Parsons tunnel. Officially the class 43 powercar is still the worlds fastest diesel train having attained a record speed of 148mph under test conditions. 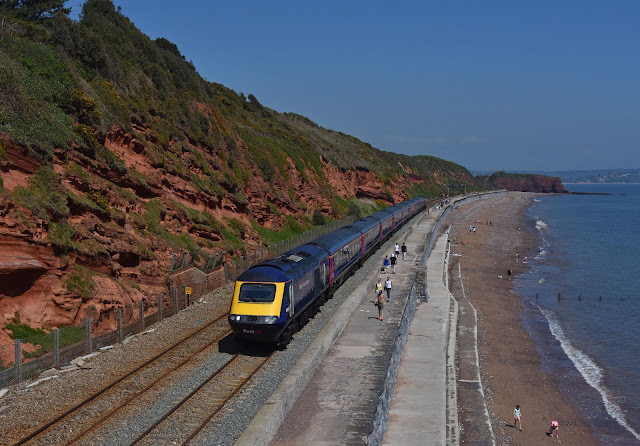 In 2018 however a large proportion of the front line HST duties will be relinquished to the new InterCityExpress trains being built by Hitachi. Class 800's have already taken many of the HST's duties out of London Paddington with deliveries continuing. ECML duties will commence with IEP later this year while the West Country routes to Devon and Cornwall have already seen testing with a class 802 IEP, which will be provided with larger diesel engines to cope with the challenging Devon banks on this route. 2018 therefore is the swansong of the HST on many of the routes it has been familiar with over the last 40 years. One of the most spectacular of these railways is undoubtedly the South Devon Mainline between Exeter and Newton Abbot where Brunels railway skirts the Exe Estuary before running along the Atlantic Coast sea wall at Dawlish and Teignmouth before once again turning inland and following the estuary of the River Teign up to Newton Abbot. This is was a challenging section of railway to build, and as seen in recent years is increasingly difficult to maintain. Cross Countries 43384 leads 43301 on 1V52 from Glasgow to Paignton. Even from it's inception the line has had difficulties- initially with the futuristic propulsion method proposed by Brunell with his 'Atmospheric Railway'- using a vacuum in a tube to power trains. The system used a series of stationary engines to pump a vacuum into a tube into which the trains connected through a leather strip. The system lasted barely a year with constant problems with the leather seal caused by the salt sea water and the railway being constantly battered by the elements. 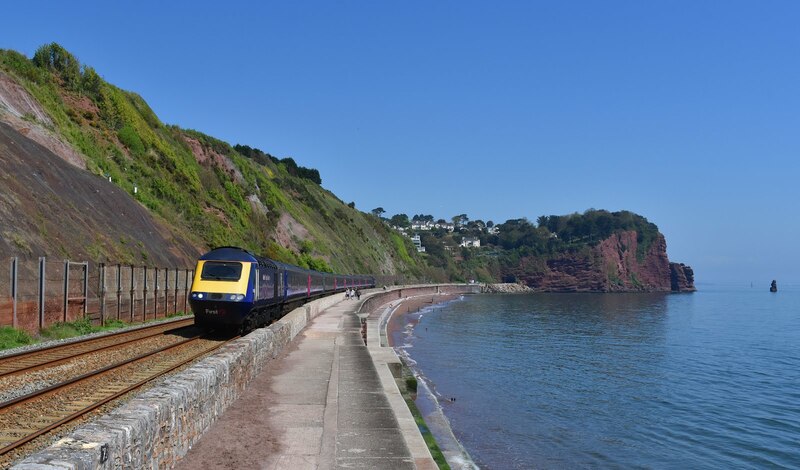 Today all that remains of the Atmospheric Railway is one of the original pumphouses at Starcross, and, of course the GWR railway alignment along the troublesome coast and up and over the steep Devon banks. Another classic sea wall location as 43010 parts with the Atlantic at Teignmouth on the rear of the 07:27 from Paddington. 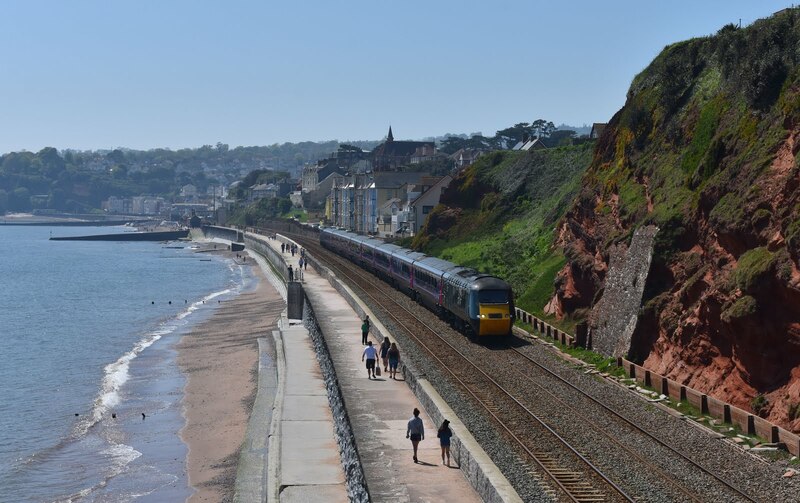 While the legacy of Brunel's South Devon Railway may be a headache for Network Rail who now must maintain it, the views it offers to passengers are simply stunning- and there is no better way to enjoy them than from an open window on an HST. While HST's will shortly disappear from Great Western Railway InterCity services along the sea wall this is not the end altogether for these trains. 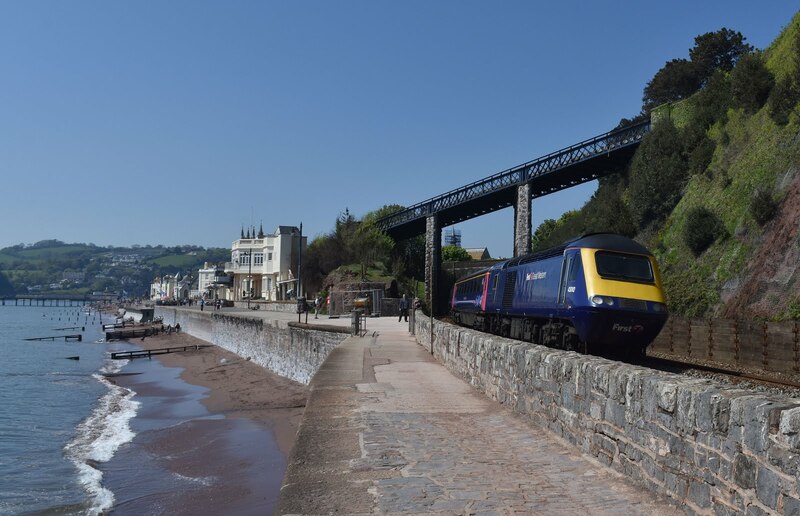 11 Short HST's with four or five coaches are being retained by GWR for local services between Cardiff and Penzance- these will be fully refurbished and fitted with automatic doors. 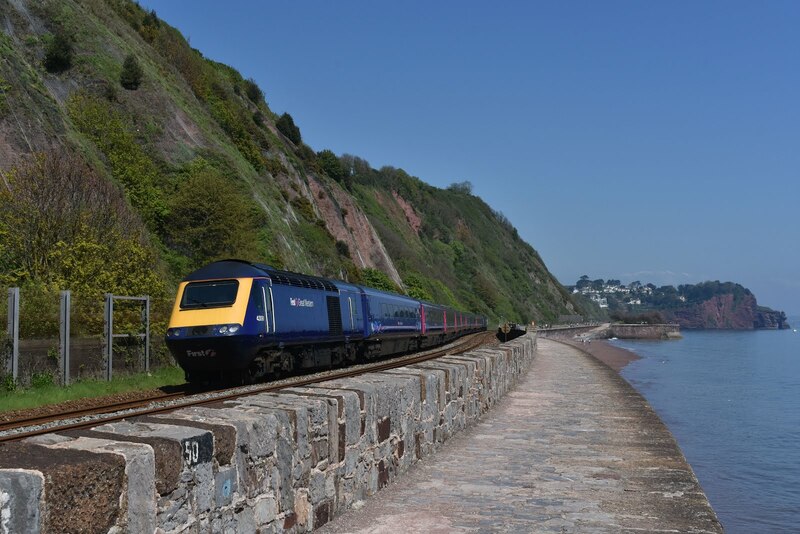 Similarly Cross Country will retain its small fleet of five HST's which work the South West - Scotland axis. 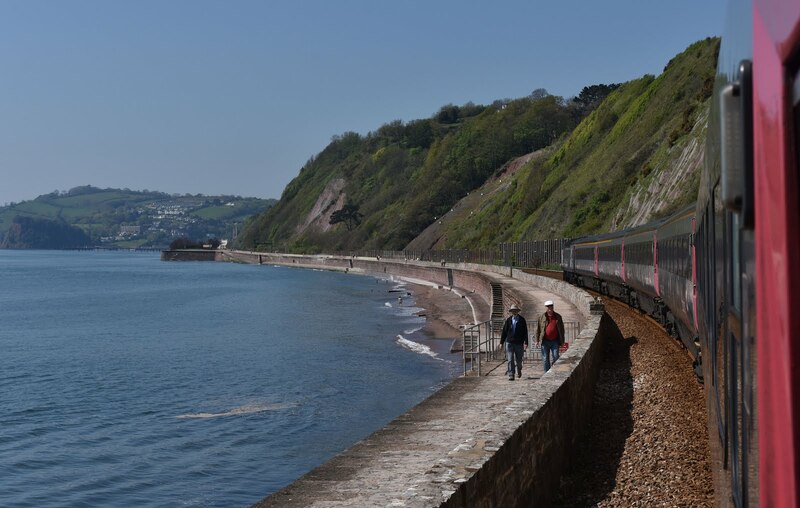 As for the displaced HST's from GWR- the majority of the fleet will be refurbished and make their way to Scotland where they will begin a new chapter in their history providing rapid and comfortable links between Scotland's largest cities.